Do you feel anxious before an interview, presentation, or exam? Do you lie awake at night worrying? Does anxiety affect your choices every day? If so, you are not alone. Anxiety affects 14% of all Australians aged 16-85 years, and women are more likely to experience anxiety than men. According to a recent survey*, most of the rest of us are worriers. More than 80% of respondents under 30 worried moderately to a lot about work or study. More than half worried about social interactions and nearly 70% stressed about their image, including looks and achievements. Anxiety starts around age 13 and is now predicted to continue throughout life. To counter their anxiety, many people self-medicate with alcohol, prescription drugs, cigarettes, or over-eating — but these only temporarily mask anxiety. Currently there is concern about the over-use of prescription drugs, and a trend for young women under 25 to use medications casually to solve their problems of anxiety. If any of this sounds familiar, then you will be happy to know there is a natural way to reduce anxiety – the Transcendental Meditation technique activates the body’s own inner capacity to protect you against anxiety and stress. How does TM compare to other techniques in reducing anxiety? Feelings of panic and anxiety are physiologically identical to the “fight-or-flight” response. When you sit quietly to practise your Transcendental Meditation technique the exact physiological opposite of the fight-or-flight stress response is produced. Your mind and body settle down to experience deep rest and inner peacefulness. By meditating regularly twice a day your mind becomes more settled and more accustomed to that calm state. The scientific research verifies that the fear and anxiety will gradually fade away. 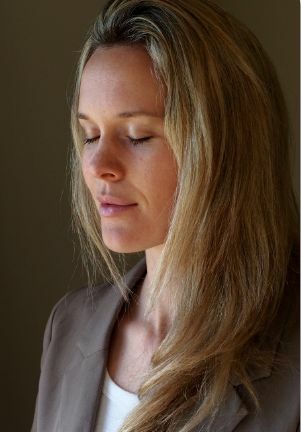 It is proven that TM is twice as effective in reducing anxiety as other techniques – Progressive Relaxation, the Relaxation Response, Concentration Meditation, EMG Biofeedback, according to a comprehensive meta-analysis of 146 studies conducted at Stanford University (see chart). Interestingly, the longer the people practised TM, the greater the decrease in anxiety compared to controls. When you sit to meditate, your mind experiences greater and greater quietness and peacefulness until it transcends thought altogether. Your mind is at its most peaceful state, which is pure consciousness, your innermost Self. In this deeply rested state, anxiety is transcended. Because it is so natural, the whole process is effortless and enjoyable. Your worries are less. Your mind and emotions are lighter, your creativity and clarity of mind are greater. Life is happier and more fulfilling. Over time, regular TM practise establishes a more settled, peaceful state of mind and emotions, free of anxiety and stress. *Survey by Macquarie University Centre for Emotional Health, reported in Sydney Morning Herald, May 2012. 1. Journal of Social Behavior and Personality 6 (1991): 189–248. 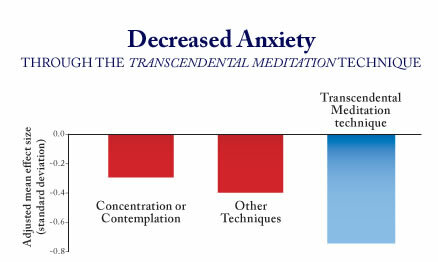 A statistical meta-analysis of 146 independent study results found that the Transcendental Meditation Program is significantly more effective in reducing trait anxiety than procedures of concentration or contemplation, or other techniques. Reference: Journal of Clinical Psychology 45: 957–974, 1989. 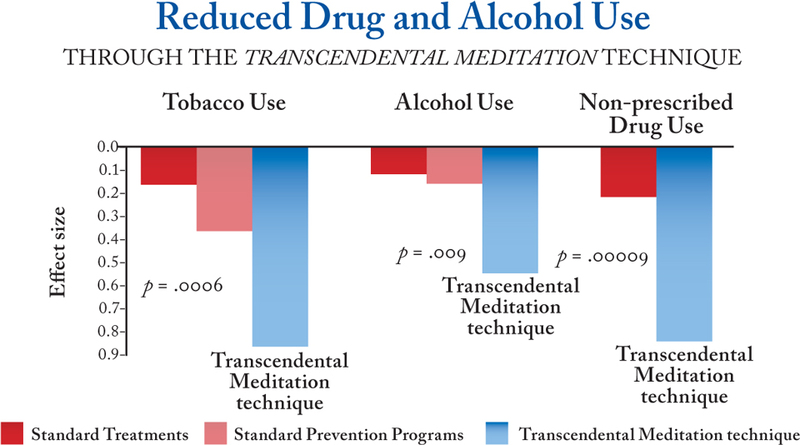 A comparison of the results of several statistical meta-analyses indicated that the Transcendental Meditation program produced significantly larger reductions in tobacco, alcohol, and non-prescribed drug use than standard substance abuse treatments and standard prevention programs. Whereas the effects of conventional programs typically fall off rapidly within three months, effects of the Transcendental Meditation program increase over time. The effects of the Transcendental Meditation program are spontaneous, based on fundamental and naturally occurring improvemetns in the individuals’ psychophysiological functioning. 1. Alcoholism Treatment Quarterly 11 (1994): 13–87. 2. International Journal of the Addictions 26 (1991): 293–325.